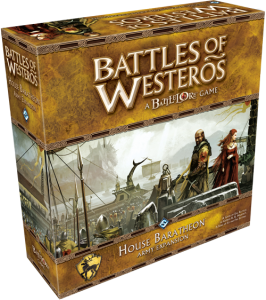 Fantasy Flight Games has released the House Baratheon expansion for their Battle of Westeros game. Now, if someone would just bring me my breastplate stretcher! The House Baratheon Army Expansion for Battles of Westeros is now on sale at your local retailer and on our webstore! Containing 110 detailed plastic miniatures, this substantial expansion allows you to choose from eight stalwart commanders. You’ll also find six potent unit types with which to wage war, forming the backbone of the army. Also inside this expansion is the first Epic Battle, the monumental battle for Blackwater Bay, along with rules for Alliance battles for as many as eight players.